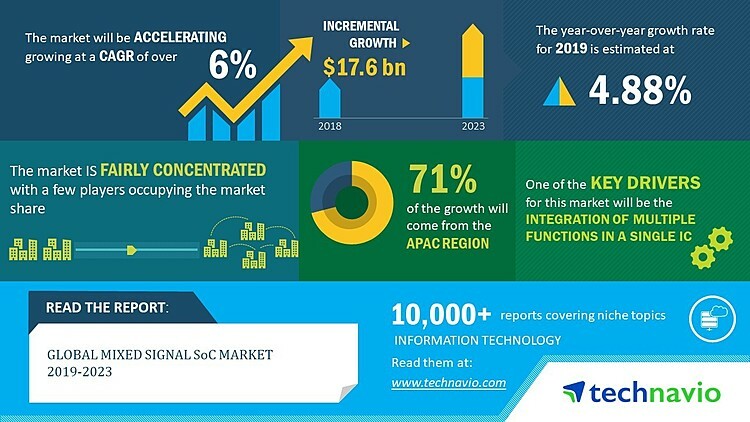 LONDON--(BUSINESS WIRE)--Apr 15, 2019--Technavio has announced the release of their research report on the global mixed-signal SoC market for the forecast period 2019-2023. This global mixed-signal SoC market analysis report segments the market by application (consumer electronics, IT and Telecommunication, automotive, and others) and geography (the Americas, APAC, and EMEA). “ APAC will see a faster growth during the forecast period. There are many OEMs of consumer electronic devices, automobiles, telecommunication equipment, and enterprise networking equipment in the region. Countries such as India, China, Indonesia, and the Philippines are generating a huge demand for smartphones. In the Americas, many automotive OEMs are investing heavily in autonomous vehicles. Autonomous vehicles are equipped with advanced sensors and electronic components. Also, the development of the telecommunication network in the region is facilitating a smooth transition from 3G/4G to 5G. Many such factors will collectively contribute to the growth of the global mixed-signal SoC market ”, says an analyst at Technavio.